Firewall and Antivirus are both two fundamental technique to provide the security to our systems. The functionality of both the application is different like Firewall protect your system from the incoming internet traffic to your system and on the other hand Antivirus just protect your system from malicious files or viruses. Firewall is just your system gatekeeper which protects your system from the outer world(Internet). On the other place, Antivirus is just like your system security man which keeps your system safe from malicious files and viruses. A firewall is a hardware device or software which acts as a shield between your system network and the internet. It continuously monitors the incoming and outgoing network traffic to provide the security against suspicious packets. Firewall permit or deny the incoming packet using some set of rules. It also blocks access to some unsecured websites which are not safe for your system. An antivirus is a software which protects your system internally from viruses, worms, and malicious files. It can also protect from malicious programs which are coming from the internet. There are three main approaches that an Antivirus follow to keeps your system secure. Detection/ Scan: Antivirus knows the behavior of all malicious files and viruses. So the first step is to scan these malicious files and viruses. Identification: After the successful scan it then identifies which type of malicious program it is. Removal: Last step is to remove these viruses from your system to keeps your system safe and secure. Firewall protects your system from incoming and outgoing traffic. Antivirus protects your system from malicious files and viruses. Firewall implemented using the hardware or software. Antivirus implemented only by software. It continuously monitors the incoming and outgoing traffic. It just scans, identifies and removes the viruses if found. Antivirus protects your system from external as well as internal attacks. 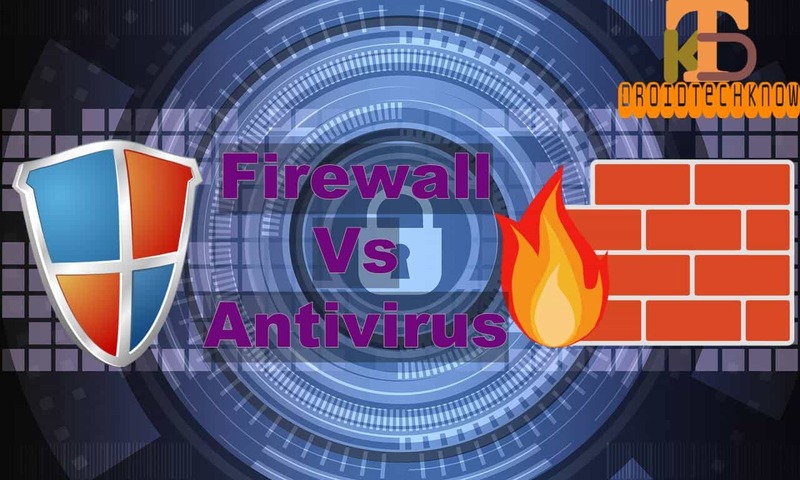 Firewall and Antivirus both keep your system safe and secure internally as well as externally, however, the mechanism of protecting the system is different. A firewall protects your system from incoming network traffic on the other hand Antivirus can protect your system from malicious files or program which is in your system. So both of them together secure your system from internal as well as external threats.